What is that I see upon the future? OH IT’S JUST NANOWRIMO. And what could be better than talking about your upcoming project?! (Well, cake probably. Cake is always better.) I can’t WAIT to hear what you’re working on. Let’s get ready to create some worlds and kill some characters be nice to our characters! 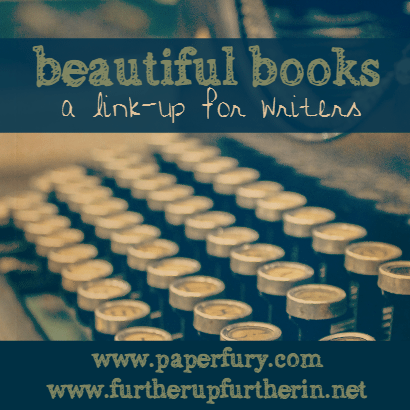 Just like every year, we’re giving our monthly link up “Beautiful People” a small rest so we can focus on “Beautiful Books”. (You can see last year’s Stage 1, Stage 2, and Stage 3 linkups.) Sky and I host Beautiful Books so we can focus on our NaNoWriMo projects. The format is the same as Beautiful People. We’ll post 10 questions to answer about your WiP — aka your beautiful book. Answer the questions in a blog post of your own and then come back here to link up! Don’t forget to grab the blog button and link to this post. NOTE: You can do it for ANY novel! You do not need to be doing NaNo to join in. are you doing NaNo?? can you give me a sneaky peek at what you’re working on? (i am the curious) and since we’re chatting over cake and tea — what are some thing you do to get ready for NaNoWriMo?? and if you’re NOT NaNoing, just tell me what project you’re working on! Ohhh, world building! YAY. I always focus on world building more in 2nd (and onwards) drafts because in my first draft there is literally no sense anywhere to be seen.😂 Eeep, rewriting beginnings can be hard. ALL THE CAKE FOR YOU, MY FRIEND. Omggg, broken laptops ARE NOT OKAY. Mine is super slow at the moment and I have to really BASH some keys to make them work. 😭 I hope yours either fixes itself or a billionaire magnanimously sweeps across your path and spontaneously buys you a new laptop. < -- very likely to happen I'M SURE. I was just finishing my NaNoWriMo Prep post up for today when I got the notification for this post! Next Wednesday though, I’m on it. OH GOODIE!! I can’t wait to read it, Jane! 😀 Ohh and a sequel?! That sounds fabulous! I haven’t written a sequel in FOREVER and I think it’s kind of daunting.😂 I hope yours goes super well! Plotting is very handy for NaNo that’s for sure.😉 I used to try winging it but noooo I would much rather have an outline! Hmmm…. I feel like I need to participate in this, yet I’m keeping my book under wraps for right now… Well, that could make for an interesting blog post, I suppose, hahaha! “What inspired the idea for–” NO! I actually just might have to try this…..
I’m definitely planning for NaNo!! I’m a HUGE planner. 😂 I just have to decide between the 93839 outlines I have written out, hehe. Although it’s leaning between pirates and a contemporary about a boy who steals houses (shhh it works I promise). ANYWAY. I totally understand about keeping things underwraps. But that just makes me sooo curious about your project. heeh. 😂 I SHALL CONTAIN MYSELF. Yayay! I can’t wait to give this a crack for the first time. I am MORE than ready to smash out my book idea, I’ve had the idea for my book for sooo long and it’s amazing to think how much it’s changed from the original idea. I really can’t wait to do NaNoWriMo and UNLEASH my imagination. I feel like there needs to be at least one scene where dragons are having a tea party (am I right? oh how I’d love to go to a dragon tea party). AHHH THAT’S WONDERFUL, KIRSTIE!! *flings confetti and sprinkles everywhere* I hope there are dragons. Like what is a book without dragons, amirite?! I was thinking of writing a contemporary, but, like surely they can have dragons and use them as pizza ovens, yes? I’m not sure if I’ll participate in NaNoWriMo this year (not that I don’t want to, but school might limit my time too much to make it realistic), but I wrote the thing anyway. T’was a lot of fun. Thanks for the questionnaire! Oh you are most welcome!! And I totally understand about time constraints. *nods* Being at the end of the year Nano can be a bit tricky to squish in, right?! Thanks so much for the help, Cait! I haven’t done NaNo before, so I’m “a bit” nervous! My link will be going up in a little while! I’m doing NaNo! I just … don’t know what book to write. I’ve narrowed it down to four options and put a poll on my blog, and hopefully that’ll solve my quandary. But what do I do to prepare for NaNo I … Uh … I pick out a book from my ENORMOUS backlog of WIP’s, sit down on November 1st, and start writing. I’m going to do a poll too because I CAN’T PICK A PROJECT hahaha #dead 😂 And that sounds like a lot of preparing you do there. 😉 That’s awesome! I tend to prepare a LOT with outlines and things hehe. Oh wow, this looks so fun to do, but I don’t have a blog!!! I am doing NaNoWriMo this year (my username is Rationally Ill if anyone’s interested), so right now I’m outlining. It’s my first time trying to outline the entire book, and it’s waaaaay more fun than I thought it would be! Mostly because I’m letting the characters be sassy and destructive in the outline. Lots of things are on fire. People are dead. It’s glorious! My blurb for the book is thus: Scavenger firebrand Aubrey is desperate to find enough rare objects so she can find passage to Avalon. The mysterious island is rumored to be a safe haven for firebrands like her, who are usually executed once their dangerous fire powers are discovered. When she and her young companion Patton gain the dangerous attention of General Ophelia Sulla and her ruthless band of Enforcers, however, Aubrey must team up with strange firebrand Jase to avoid the ambitious Lord Trenton and the other councilors of the capitol city Darkspire. I just assembled this blurb three days ago, so it’s kind of blah, but whatever. Basically, it takes place maybe a thousand years after some poor bloke with fire powers accidentally set most of the planet on fire. Now most of the world is forgotten and buried under piles of ash. Everyone has some sort of super power, but those with firepower, called firebrands, well…nobody likes them since the whole world-is-on-fire stuff, so they’re usually killed. Aubrey (my wonderfully violent MC) has survived this long by hiding, lying, and setting people and towns on fire. Patton (who’s ten) can turn into any substance he touches. He’s been traveling with Aubrey for a while, but he hasn’t told her yet that he’s kind of wanted by the very powerful and scary Lord Trenton, who is this close to ruling the world with his literally-metal fist. Mostly because he doesn’t want Aubrey to set a continent on fire. Jase is the guy who set the planet on fire in the first place. He had a problem with time travel, which is how he ended up with Aubrey and Patton. He has no idea what is going on and he’s totally traumatized. Aubrey hates him. I’m so excited about this. I’ve never finished NaNo before, but this year I will prevail! DUDE, THIS SOUNDS AMAZING!! And I entirely agree with you on steampunk outfits. THEY ARE AWESOME.😍 Plus yes and yes to exploding things and being sassy and everyone ending up dead. :’) Truly inspiration. That is exactly my kind of book. Plus dragons?! THIS SPEAKS TO ME ON A SPIRTIUAL LEVEL. I’M ALREADY SUPER EXCITED AHHHH!! I hope it’s super fun to write!! And I shall be here to cheer you finishing NaNo! It’s my first time and I’M FREAKING OUT. Mostly because I’ve got two novels and I can’t decide which one to write (I’ll probably become a WriMo rebel and JUST WRITE BOTH) because my brain is being naughty and indecisive. I’M NOT GETTING READY. I’m going die-hard panster this NaNoWriMo *nods*. Letting the ideas stew in my head (and finding pictures for inspiration) is the extent of my planning. PLANNING TAKES THE FUN OUT OF IT. So I’m not planning XD. Omg I’m having the SAME problem with not being able to decide!! So you’re not alone. *hi fives for indecision* 😂 But good on you for being a pantster!! I have to outline hahah, and if I don’t I get SO STUCK and end up just sobbing in a ball in the corner. But I can’t wait to read your NaNo post! I’m super excited to hear what you’re going to write!! I am aware that I have said on here that I will not be doing NaNo, but apparently I am a glutton for punishment so on Monday the 3rd of October I submitted my novel. I mean due to all the horrendousness happening the month of NaNo (aka next month…!!!!) I will be cheating slightly and have already started writing it… whoops haha. This year I will be writing an urban fantasy supernatural crime family drama romance mess thing and I cannot wait. It’s taking some old characters and some new characters and I think that this is The One. It’s technically a re-write but I will be ignoring the previous drafts and it has a new working title as well which I love! I’m also considering writing something else as well as a fun side project, but that might be a touch too much – even for me haha! I get ready for NaNoing by doing a heck of a lot of panicking and a bit of idea noting. But I am mostly a pantser (a tiny bit of a plantser) so I just sit down and do it! OH YAYYYY! *flings confetti all around* There’s nothing like stressing oneself out over a book anyway, right?! :’) Good times. And rewrites are awesome! Last month, I actually was rewriting a book I first wrote 7 years ago and it was soooo good to be back with my old favourite characters. So I hope your rewrite is as fun and exciting! And panicking is definitely solid NaNo prep. GOOD JOB THERE, CHLOE. I haven’t decided yet…*howls* I’m going to do a post and have everyone vote.😂 I HAVE SO MANY IDEAS AND OUTLINES IT’S RIDICULOUS. This will be my third re-write of this book, so right now I just want to shake them and ask them why they aren’t doing what I need them to! I’M SO EXCITED TO DO THIS. I’ve been remorselessly cheating at NaNoWriMo for several years now, always using the month to write books I’d already been working on anyway, but this year I’m COMMITTED to actually doing the thing properly and writing a new book from scratch. WHICH IS SCARY. But I think it’ll be rewarding. Or brain-breaking. One of the two? Eeeep, good for you! !😂 This will be my 3rd year and I’m really excited EEEEP because there’s just so much camaraderie during NaNo, right?! I LOVE IT. But good on you for going from scratch! Are you outlining at all? THAT IS ACTUALLY SUPER AWESOME. Last month I was just rewriting a book I’d first written 7 years ago. And the rewrite was SO FUN. Not perfect. But early drafts don’t have to be perfect, amirite?! *nods* OHhh, good luck with the plotting book!! I always plot from feel, but it’d be nice to do more of a structure someday heheh. BUT GO YOU! I SHALL BE CHEERING FOR YOU TO WIN NANO!! I am new to your blog, but it’s great! As for my NaNo project, it is the first in a series I am planning, (The Teashop Chronicles), and it is called (currently) To The Moon And Back. Sounds super exciting, I’m sure. No. Not really. I feel like every one is writing exciting novels except me. But I am already so far into the plot, I can’t just quit now. Oh welcome welcome! *gives you all the welcome cake* I’m so glad you stopped by, and omg your title is AMAZING. I love it! I was ALL SET (okay, mostly set as in I was still playing eeny-meeny-minney-moe with my Pinterest boards) on what to write for Nano this year until I read your fairytale post last month! Now I’m outlining a monster of a trilogy using the Little Mermaid, Little Red Riding Hood and Hansel and Gretel set in Japan/Korea/China during the 1592-1598 Japanese Invasions of Korea with some gender bending and possibly NO magic (not easy for little mermaid!!). The first story involved will be Little Mermaid with pirates and political sabotage… possibly some explosions if the characters get their way. It’ll definitely be alternative history, because ALL OF THE RESEARCH. *laughs and cries at the same time* So that’s my Nano for this year. Once I get this beast outlined, I’ll try to remember to write up a post to link! EEEEEEEEEEP THIS IS LOVELY. I am so stoked for NaNo. *screams and flails incoherently* I’m going to be writing a contemporary YA fiction that is actually a companion book/spinoff from the novel I just finished?? LOL BASICALLY MY SISTER FIRST THOUGHT OF THE CONCEPT AND THEN I IMPROVED IT AND NOW SHE’S BLACKMAILING ME TO WRITE IT. #stress wooooot xD but I’m a shy limpet so I’m still working up the courage to unlock my Pinterest board for this WIP *much nervous laughter* I NEED TO BE MORE ADVENTUROUS OMG. I’m usually kind of closed off about my stories. I love talking about them but at the same time sometimes I feel like I may invoke the I-hate-my-novel-I-don’t-know-how-I-ever-thought-this-was-good phase faster XD But I think I have so much faith on this one that I couldn’t help sharing. Thanks for the amazing feature! Answering the questions was so much fun! Aaah I’m so under-prepared. I only decided on my project a few days ago, but basically it’s a retelling of The Juniper Tree because super dark fairy tales are fuuun. Yesss it’s very dark. There’s beheading little boys and eating said boys and dead boys turning into birds to get revenge. Sadly, I will not be able to do NaNoWriMo this year 🙁 (Curse you school!!) but I do have a WIP!! SO currently I am working on my book called the Shadow King. It is a dark fantasy with some morally questionable protagonists (The best kind of protagonists) Anyways, I am super excited for it!!!!!!! Amazing post!! AGh, that is SADNESS but good luck with school!! BUT OMG THE SHADOW KING IS A FANTASTIC TITLE I LOVE IT ALREADY. The only kind of protagonists are the morally grey questionable ones. 😉 This is fact. Good luck with this awesomeness!! To do his or not to do this is truly a question. Hmm. I am not doing NaNo, for multiple reasons, the top three being, 1) school is really busy 2) I’M SCARED 3) I need to finish my other writing projects before I even think of starting another one. I’m currently scrambling to finish Gearbound, so I can finally start on cleaning it up and then starting the second draft. I AM SO EXCITED FOR THE SECOND DRAFT. I am literally STOKED for NaNoWriMo! Last year was my first year, and I DOMINATED. Ahem. This year, I will further a half-done draft of an epic fantasy I started a year ago (THE SHAME) but I am DETERMINED TO FINISH IT. IT HAS NO CHOICE. WOOOOOO THIS IS AWESOME. *flings confetti* And I’m so glad you ruled NaNo last year! THIS YEAR YOU WILL BE EMPRESS OF NANO. < -- definitely legit title. As for a sneak peek of my book, I did link up, so I now have an entire post related to my book!! (Yay!!!) However, in short, it is a sci-five, fantasy, dystopian thing that is set off on an island world, with government conspiracies, possible death, experimentation… You know, all the good stuff. That being said, this is honestly like nothing I’ve ever read or heard of before, so I’m really eager to see where it leads me!!! As this is my second time doing NaNo in November, I’m not exactly sure what I like to do before November actually hits, other than plan my novel and get ready to die, but I’d have to say I’ve been knitting a LOT. I’m debating making a NaNo hat tradition, where I knit a hat as a reward for hitting my daily word goals… Not sure if that will become a reality, though. A NaNo hat sounds like the most awesome of traditions though. *nods* I APPROVE. And I totally agree! New genres are SO much fun! I’m just now getting around to commenting…woops! Who’s ready for Nano Wrimo? I’M READY FOR NANO WRIMO! Finally went and put together this post for my Nano project. So exciting to see the vast array of stories other people are working on. Let’s get ready to write, people! I need a lot of cake to prep for this……. I would totally love to do the NaNo thingy. (am too lazy to scroll up to look at what it’s actually called). But work takes up sooooo much of my time and when I’m not working, I’m grinding out Destiny. lol. The struggle is real. Ah, NaNo isn’t for everyone, so don’t worry too much! hehe. And any story can become more original with plotting and refining and tons of work right?! *gives you motivational cake* BUT AWW, I’M SO GLAD YOU LIKE MY BLOG AND REVIEWS. <3 That means so much! Thank you! I’ve never participated in this link-up before (this is the first year I’m doing NaNoWriMo after all). But I’m glad I found it *excited clapping* seeing others’ posts made me more excited for November and I’m ready to hit that 50,000 🙂 I haven’t finished outlining and with only 7 days left to go, it’s driving me CRAZY. Also I’m kinda worried about the first day like what if I end up sitting in front of a blank page, with no idea what to write? If I don’t hit the word count for tht first day I’m afraid of being unmotivated for the rest…..
Eeep, I hope you have fun with NaNo! And I hope that outline behaves itself for you! Mine is giving me a headache right now too, argh. hehe. WE HAVE TIME! WE CAN GET THIS READY!! Oh good luck with NaNo, Jenny! I HOPE YOU HAVE TONS OF FUN! YAYYYY. I CAN’T WAIT TO READ THIS!! I like your list but I’m not quite sure what’s meant by book’s aesthetic. WHO NEEDS SLEEP ANYWAY, RIGHT?! *flings sleep away and just flails wildly and writes* GOOD LUCK TO YOU!🎉 And honestly, I’m the worst at titling.😂 My only comment would be that “trials” is something I see a lot of in titles? Just from doing a lot of reading. So you could shorten it to The Thorned Hopes? BUT SERIOUSlY I HAVE NO IDEA.😂 Do what feels right for you! !